Records management is important. It not only ensures you remain compliant with regulations around records retention, but also enables you to access important information as and when you need it, whilst addressing the major issues of storage management. Capita Intelligent Communications provides scalable document storage in our highly secure warehouses. They are designed to accommodate efficient and timely access to both physical and digital records. We provide live file storage and support this with scan-on-demand services so you can access critical information quickly. Our collection and transportation services help consolidate and control documentation at our facilities. Logistical support includes a fully managed service covering the boxing, indexing, palletisation and delivery of records into our secure premises. A detailed inventory and audit trail is maintained throughout the collection and transfer process. This ensures control and visibility of the critical information in our care. Whatever your sector or size, we can manage the lifecycle of your documents. This includes the storage of all your original documents with a full audit trail, to them being securely destroyed if no longer required. This improves your efficiency, lowers operating costs and frees up time across your organisation. Your documents will be stored in our secure records management warehouses, managed by experienced security screened staff working to ISO certified processes. By using our own collection and transportation service, you can be assured of safe passage for your documents. There will be a clear audit trail from collection through to the records being deposited into our warehouse. However, it’s not about simply putting boxes on shelves. It’s about making the most out of the data and placing you in a better position to go digital. We can help you manage how your business uses its data. Your records are completely secure within our storage infrastructure, yet always available when you require them. We use a powerful bespoke document warehouse and library management with a requests management module system to access and maintain records held and managed by us. This warehouse management system provides secure, easy, quick, online access to your complete records inventory. It was developed to make it easy to search for information and place orders, for both scan-on-demand or physical retrieval. We can retrieve and provide both physical and/or digital copies of any file that is required, within 4 hours for a digital copy or next day for a physical copy. Thereby improving staff productivity and speeding up work processes. These days, every organisation is faced with the challenge of managing an increasing amount of data with fewer resources. At Capita Intelligent Communications we can not only help you store your physical records and provide box level inventories, but also provide file level indexing. A complete box audit to ensure you are paying for the storage of full boxes and not half empty ones. File indexing offers a long-term solution to the problems of document storage and organisation, giving you better control and access to your information. These days there is a lot of emphasis on businesses to ensure that their records management policy is being followed and is compliant with the law. You may be asking yourselves questions like – is everything in one location? Do we know how many copies we have? Are we at risk of a security breach? Are we GDPR compliant? How much will this cost? By digitising your documents and storing them in a document management system, you can manage this procedure much more efficiently and be able to provide a clear auditable trail. We can assist with your compliance in a number of ways. 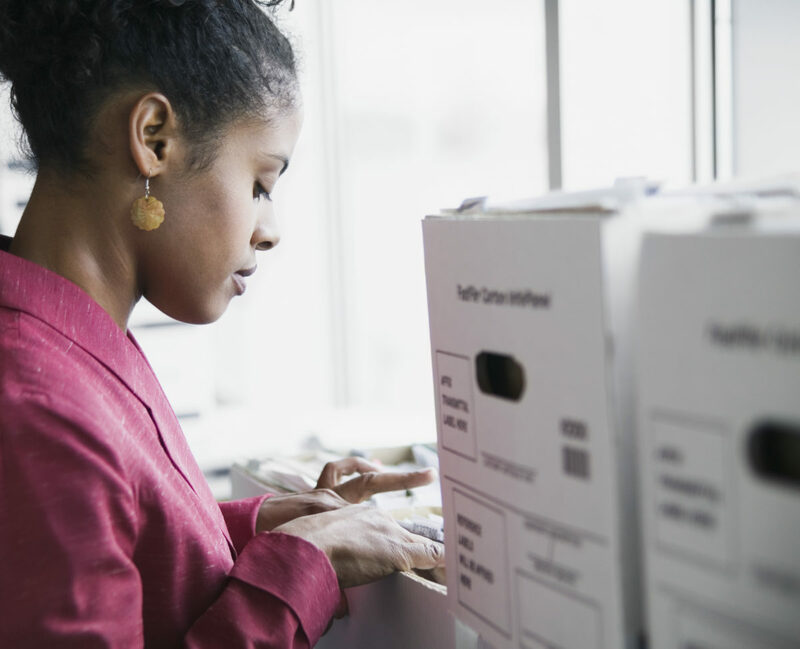 When storing your boxed documents/files we ensure that they have a valid retention/destruction date applied so that the files are only being stored for as long as is legally required. Additionally, we can offer a ‘weeding’ service, whereby we review the contents of the files to ‘weed’ out any documentation that does not need to be stored, needs to be indexed separately or returned to the client. This can often dramatically reduce the size of files and therefore create more space in boxes for other files, which in turn reduces the box holding and the overall cost for storage. We recognise that the destruction of your records is as important to your business as their storage, that’s why you can be assured your documents will be handled safely and securely. Capita Intelligent Communications will log each file in to our warehouse management system (WHMS) on arrival and will attach a date of destruction to each record; a note of this will be made both on the box and within the WHMS. These destruction dates will be in line with your retention policy and we will inform you each month which records have reached their destruction date. We will never destroy records without your sign off. With regards to paper destruction, we operate an on-site industrial shredder. Our disposal solution recycles the shredded material, which is sent to be pulped and is never sent to landfill. All non-paper consumables are removed before shredding and recycled. No third party suppliers are involved in the shredding process. All records are destroyed in line with your retention policies and we would seek authorisation from you before the destruction of any paper records. Once this has been granted, shredding will be completed within an agreed timescale. Shredding is to security Level 3 (cross cut (3.9mm x 30mm)), then bailed on-site before being collected for pulp. This meets the standard BS EN 15713:2009 Secure Destruction of Confidential Material code of practice.